Long time followers will know I am in my element at the moment as it’s nectarine season. I also love nutty shortbread…. and cream….. and although I have been making this hazelnut shortbread for years, I had never followed the recipe suggestion of serving them sandwiched with cream and sliced nectarine. This recipe was torn from an August 2008 issue of Asda magazine and I have to say it’s a pretty good combo! I have failed to ever find ground hazelnuts at the supermarket so make your own by preheating the oven to 180c or gas mark 4, tip the 150g hazelnuts onto a baking tray and bake for 10 minutes. Allow to cool for a few minutes then rub the papery skins off with kitchen towel. Any stubborn nuts can be baked for another 5 minutes until the skin comes off when rubbed. Once cool, finely chop or whizz in a blender/nut mill until you have a breadcrumb like consitancy with a few nutty pieces to give some crunch to your shortbread. Preheat the oven to 180c or gas mark 4. Beat the butter and sugar together until just mixed. Add the flours, ground hazelnuts and the egg yolk mixing with your hands to make a stiff dough. Wrap in clingfilm and chill for 30 mins. Roll the dough out between 2 sheets of cling film until approximately 4-5mm thick. Cut into 6cm rounds and transfer to a lined baking sheet. They spread slightly so allow a couple of cms between biscuits. Bake for 10-15 minutes them allow to cool on the tray for another 10 minutes before moving to a wire rack until completely cold. Whip the double cream until it holds its shape and halve, stone and slice the nectarines. 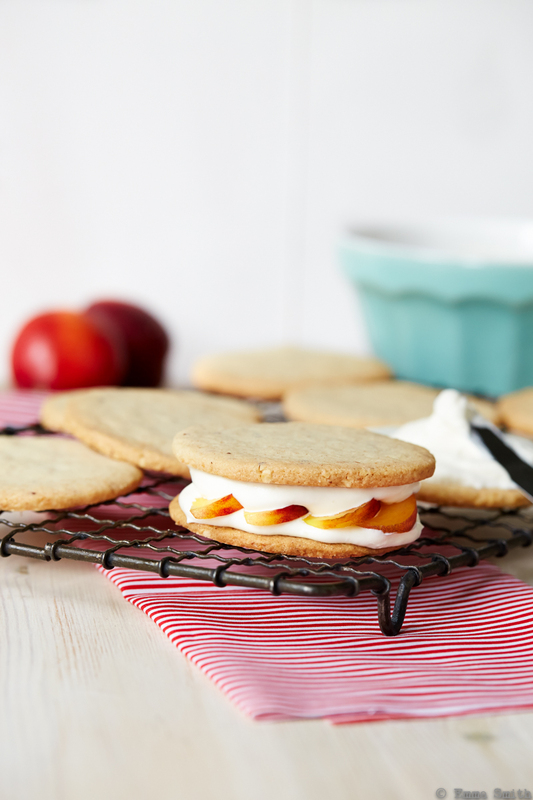 Spread some cream on each biscuit, topping one with the slices of nectarine and sandwich the other on top. If you have any left over biscuits these can be kept in an airtight container for a few days. Lovely shot. I just bought some ground hazelnuts ( a German brand) from our local Lidls. Mm yummy, sounds delicious. Thanks for sharing this.